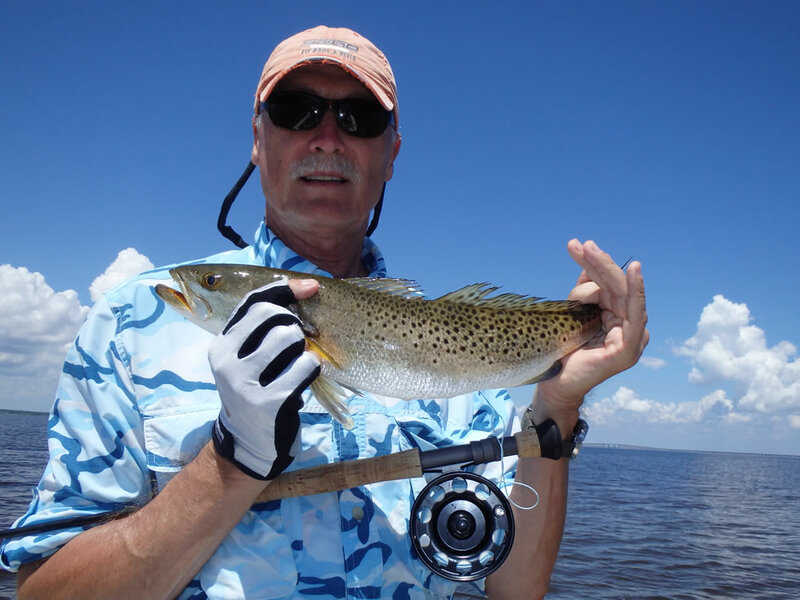 Summer 2013 was challenging due to well above normal rainfall amounts that consistently flooded the rivers that form the headwaters of Pensacola Bay. The muddy, brackish water which flowed throughout the bay system and out into the Gulf of Mexico converted our usually pristine, emerald green waters to something between "iced tea" and "coffee". 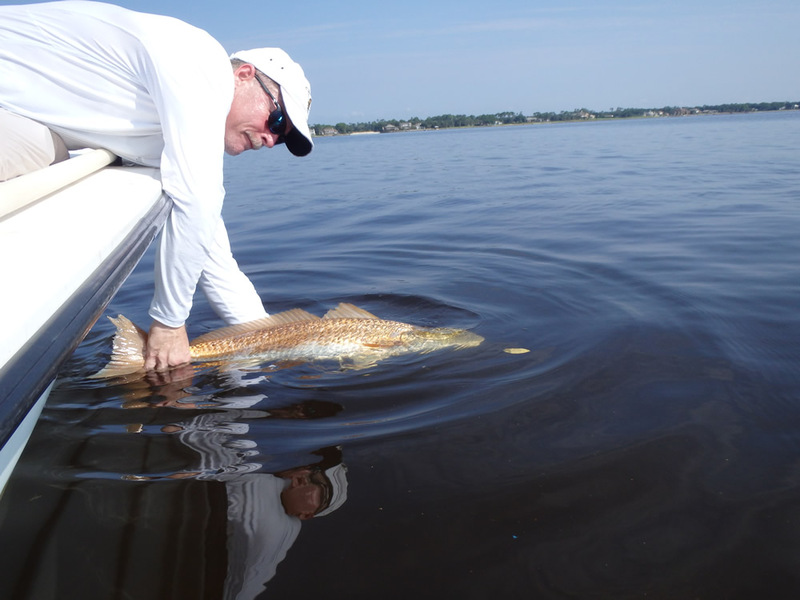 This changed the habits of many of our targeted species and generally made it more difficult to find the fish. Once we found them; however, they were ready to eat. 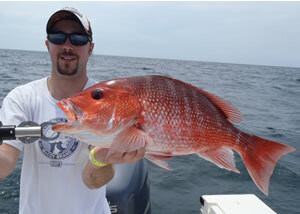 The dirty water did not negatively affect the last few weeks of red snapper season, and most of our clients limited out. 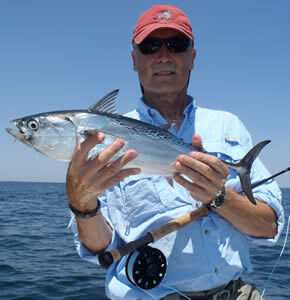 We had a very nice run of false albacore which provided many thrilling runs for our fly and light-tackle clients. 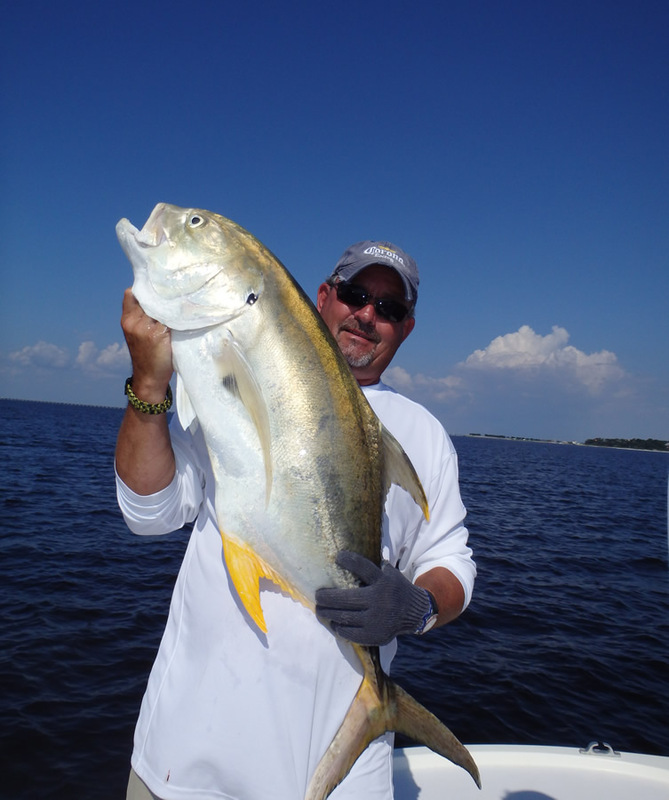 Once we got into August and September the inland waters finally cleared up enough for some explosive jack crevalle sight-fishing. 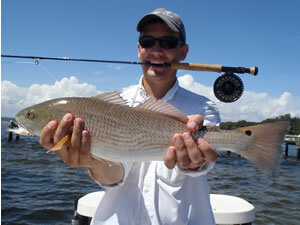 And throughout the season bull redfish popped up when we least expected them. 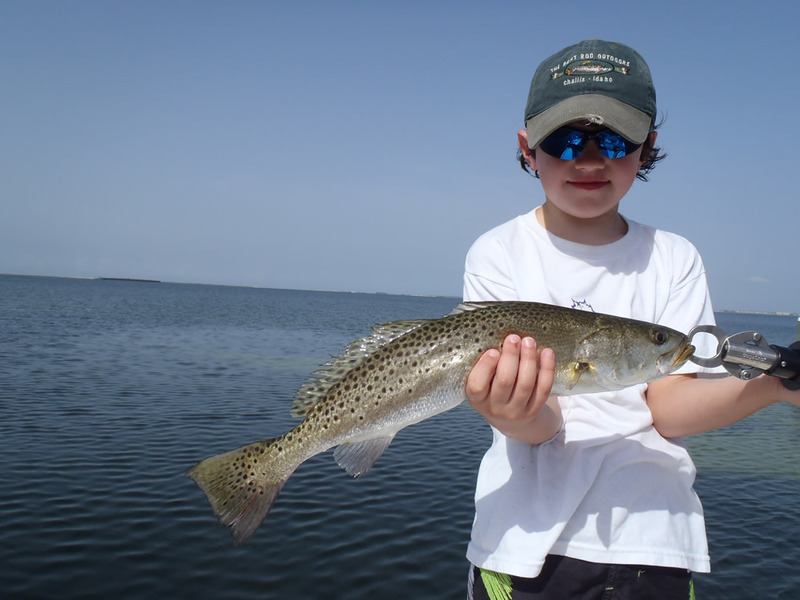 Here are the photos from this summer's season. 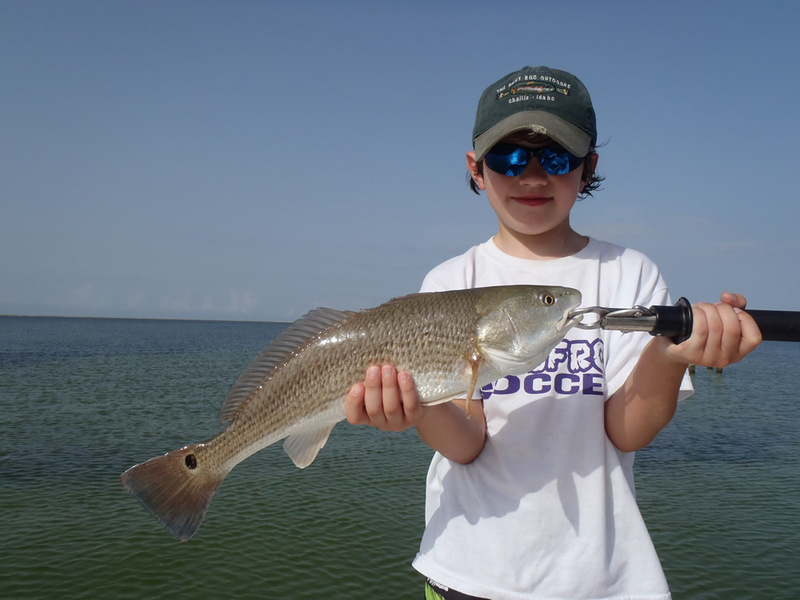 For photos from previous seasons, check out these additional galleries: Spring 2013, Winter 2013, Fall 2012, Spring 2012, Winter 2012, Fall 2011, Summer 2011, Spring 2011, Winter 2011, Fall 2010, Summer 2010, Spring 2010, Winter 2010, Fall 2009,Summer 2009, Spring 2009, Winter 2009, Fall 2008, Summer 2008, Spring 2008, Winter 2008, Fall 2007, Summer 2007, Spring 2007, Winter 2007, Fall 2006, Summer 2006, Spring 2006, Winter 2006, Spring 2005, Summer 2005, Fall 2005. Use the back button on your browser to return to this page. And David upped the ante a little with this beauty. 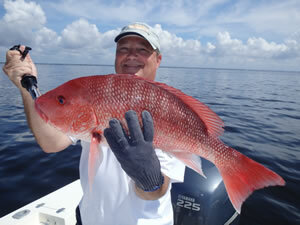 Who said you have to go way out in the Gulf of Mexico to catch impressive red snappers? 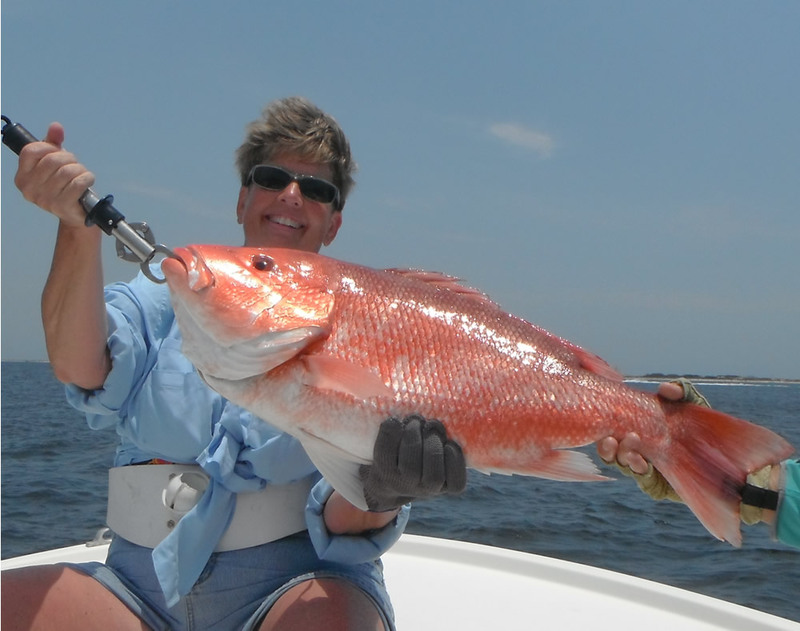 Patti Heacock landed this 16 pounder July 1 in Pensacola Bay. 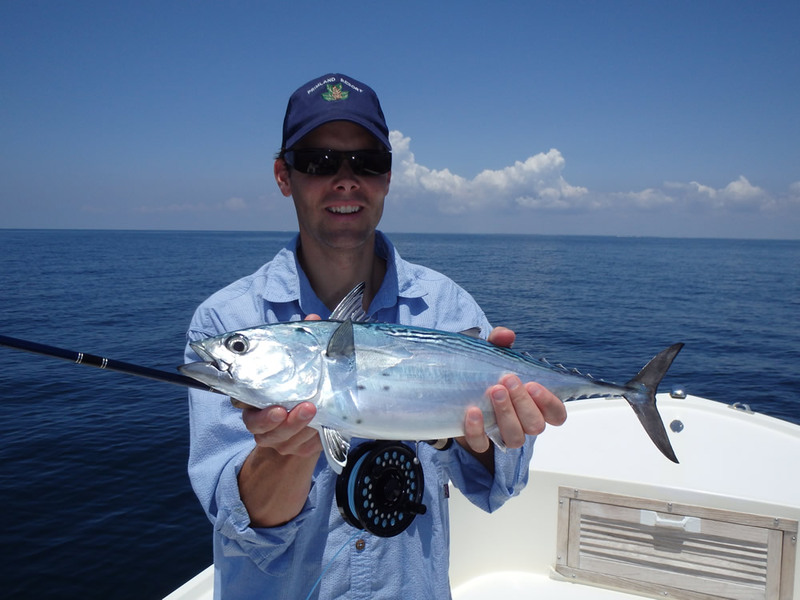 Dave Leger came all the way from Illinois to catch his first false albacore on fly, and we had to run ten miles out in the Gulf of Mexico to make it happen. 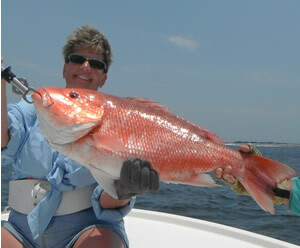 When we finally found them we were pleased to see that they were big fish in the 8 pound range. 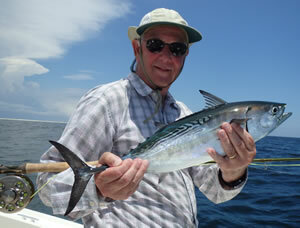 Here's Dave with his first FA. 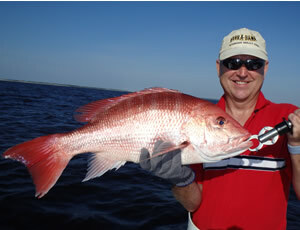 Those of you who belong to the Federation of Fly Fishers may recognize the red patch on Dave's shirt. 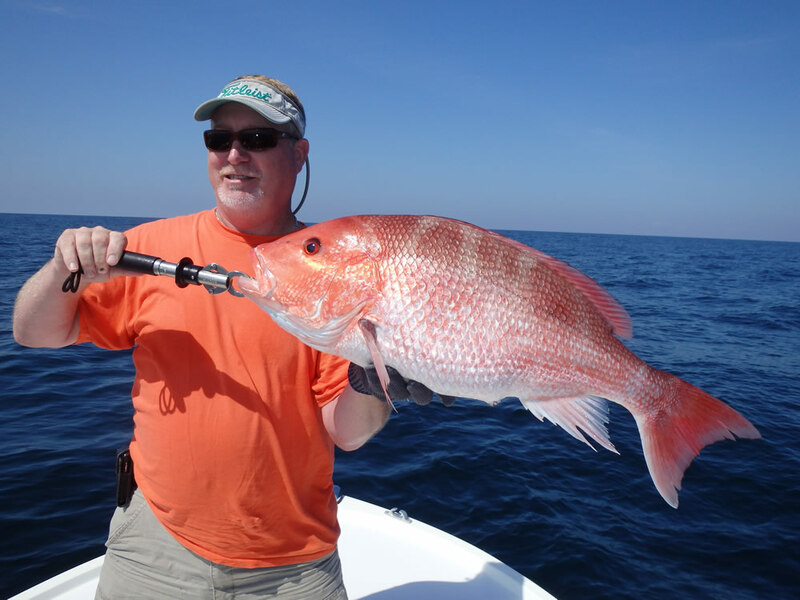 As a Certified Casting Instructor Dave was well equipped to deal with the hundreds of fish blowing up all around the boat that day. 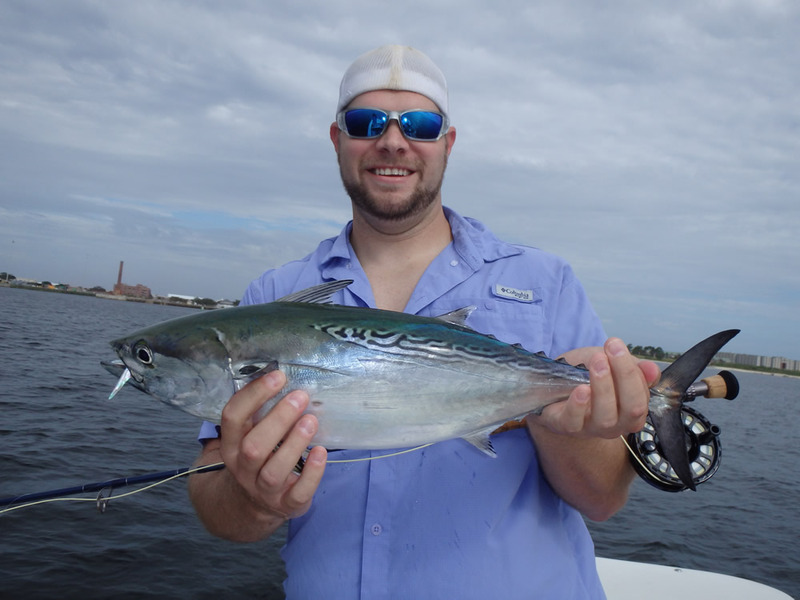 But as Dave learned that day, throwing perfect loops long distances is one thing...putting the fly on a slashing FA 30' from the boat before it disappears two seconds later is another thing... We had a blast! 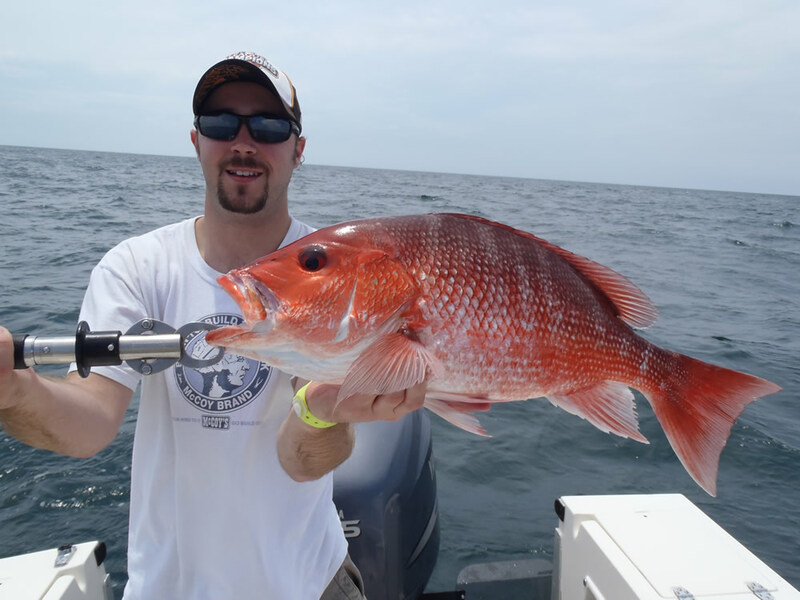 David Lalonde, Baton Rouge, and a beautiful red snapper landed July 3 while free-drifting tiny pieces of menhaden on spinning tackle in Pensacola Bay. 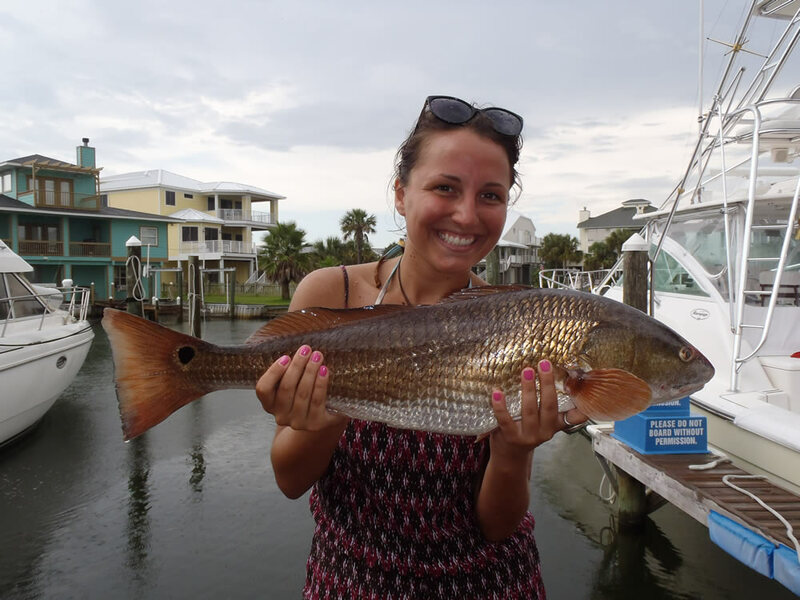 In the past it's always been David's sister Hollie Renee who made the catch that got on the website, but not this time... Way to go David! 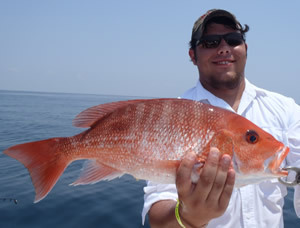 Here's Mike Bailey and a picture-perfect 14 pound red snapper headed for the cooler on July 6. 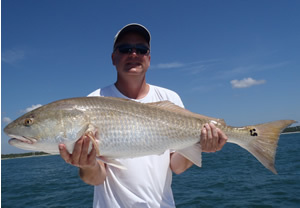 Rick's brother-in-law Coy Vincent landed and released this monster redfish a little while later in Pensacola Pass. 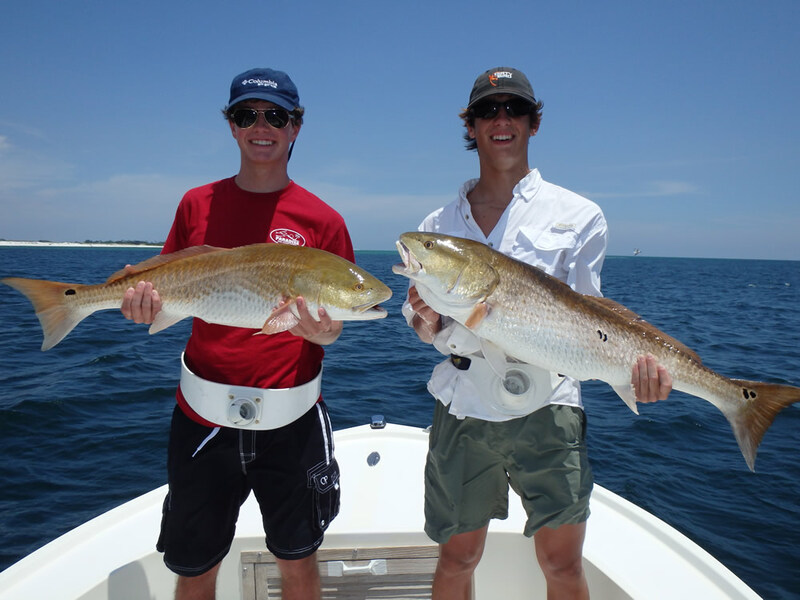 Cole Robertson and Beau Bailey with a fine redfish "double" on July 10 in Pensacola Pass. 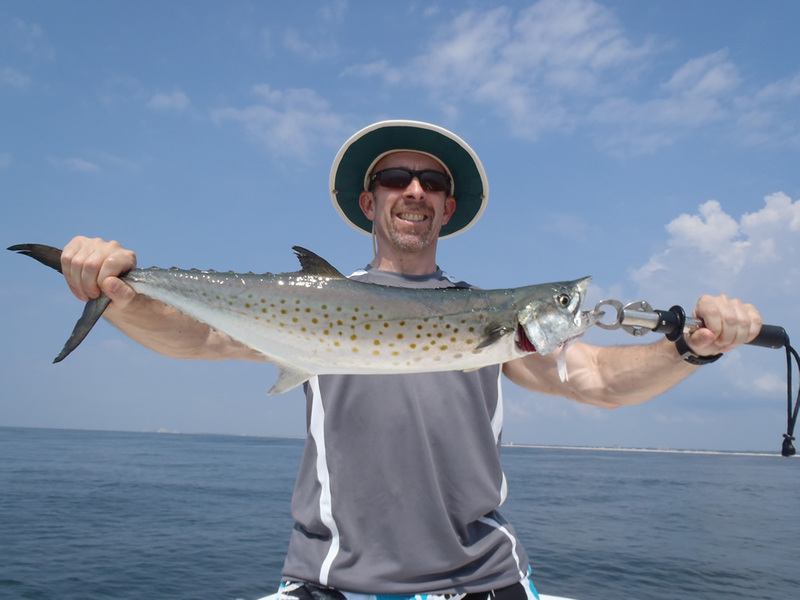 But the fireworks started earlier in the day when Beau was casting a topwater "chug bug" on ultra-light spinning tackle for Spanish mackerel in Santa Rosa Sound. 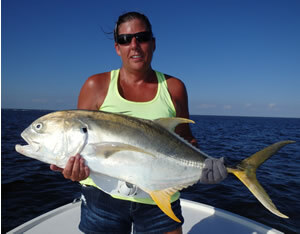 It was like a mortar went off when this jack crevalle crushed the plug 15' from the boat. 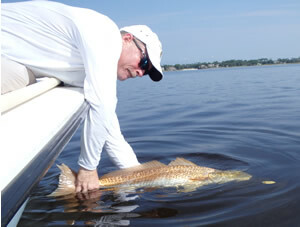 We didn't know what it was for the first 20 minutes as the fish continued to run out drag and we followed it in the boat. 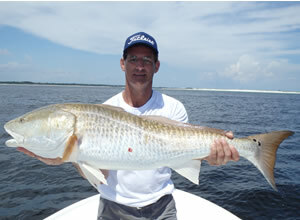 Beau fought it like a master for 45 minutes before bringing it to the net. 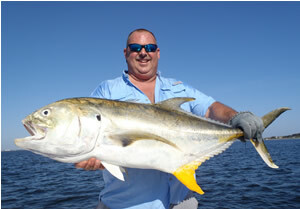 The fish weighed 26 pounds and is the all-time boat record jack on ultra-light spinning gear. 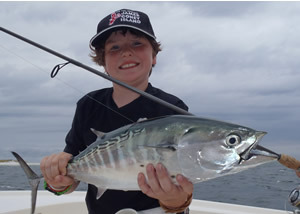 Nathan Kerr on July 12 with his first false albacore on fly...a moment he will long remember. 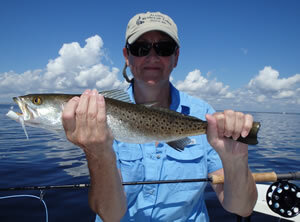 The Gulf of Mexico was spectacular that day, and we found the fish a few miles SE of Pensacola Pass. Congratulations Nathan! 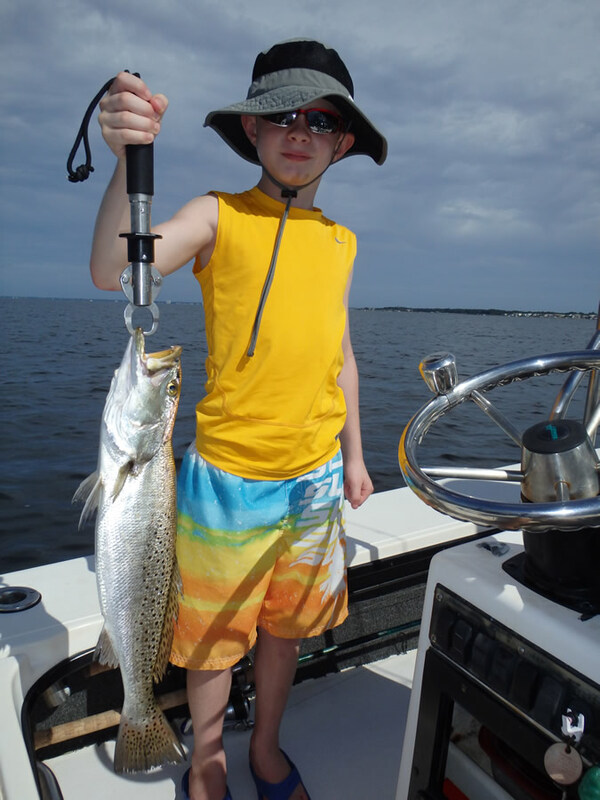 Houston's Malcolm Goodman with a fine 4 pound speckled trout on July 16. 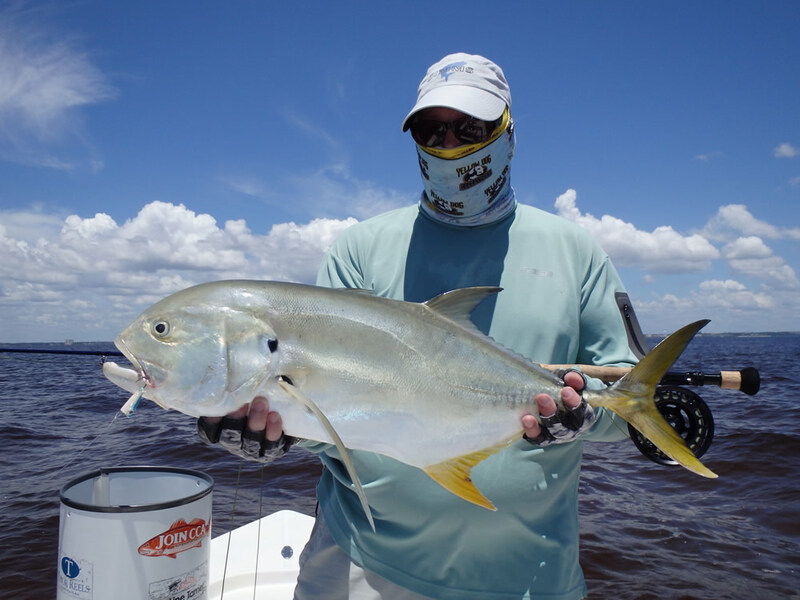 Gary Lowe came to town from Atlanta on July 17, and we staked out on a shallow point hoping the jack crevalle would come. The water is usually very clear at this spot, but the unusual spring and early-summer rains turned the water to "iced tea". 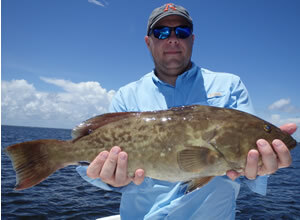 A few singles and doubles came through, and we didn't pick them up until it was too late to cast. 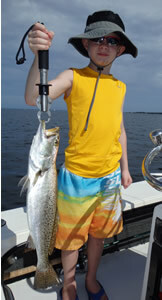 But when the mullet started showering closer and closer to the boat we knew it was game on! 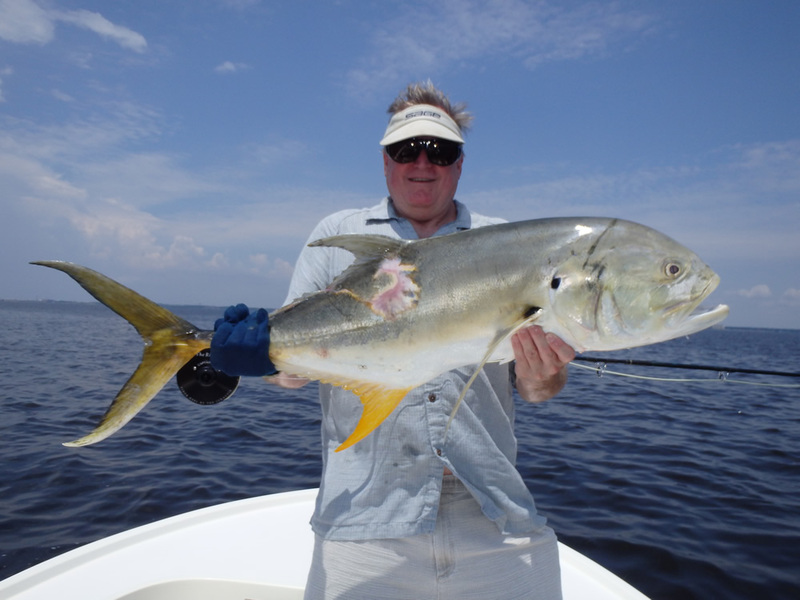 The fish appeared like a pack of wild dogs, and Gary put the popper right in their path. One strip, and the jacks all tried to get to the fly at once. 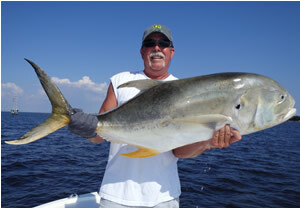 Sight-fishing for these big fish is about as good as it gets. 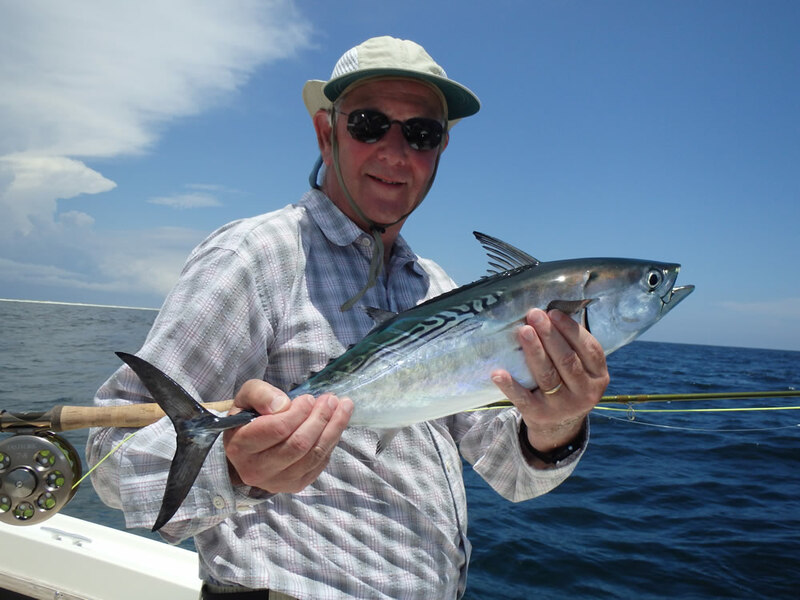 Great shot of Malcolm Goodman with a false albacore on fly landed July 18 while fishing with his son-in-law and grandson. 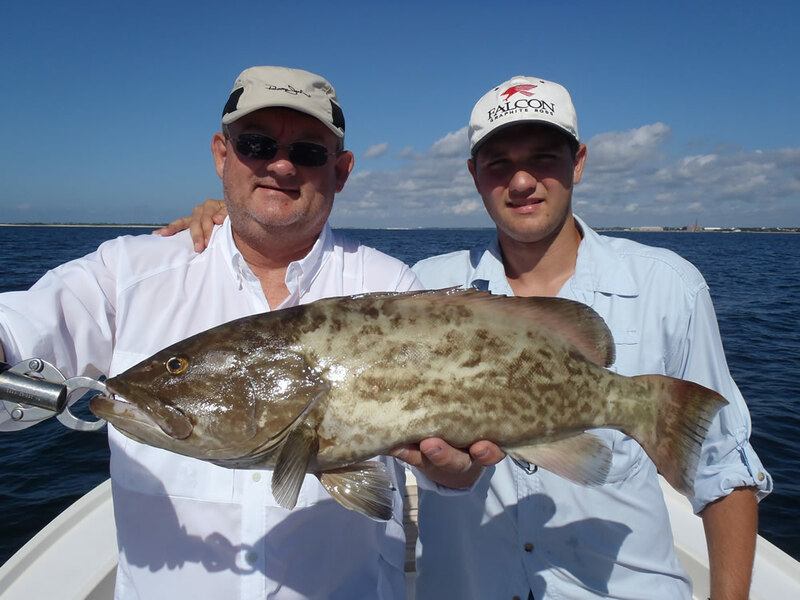 Mike and Wesley Kerce on July 19 with a Pensacola Bay gag grouper. 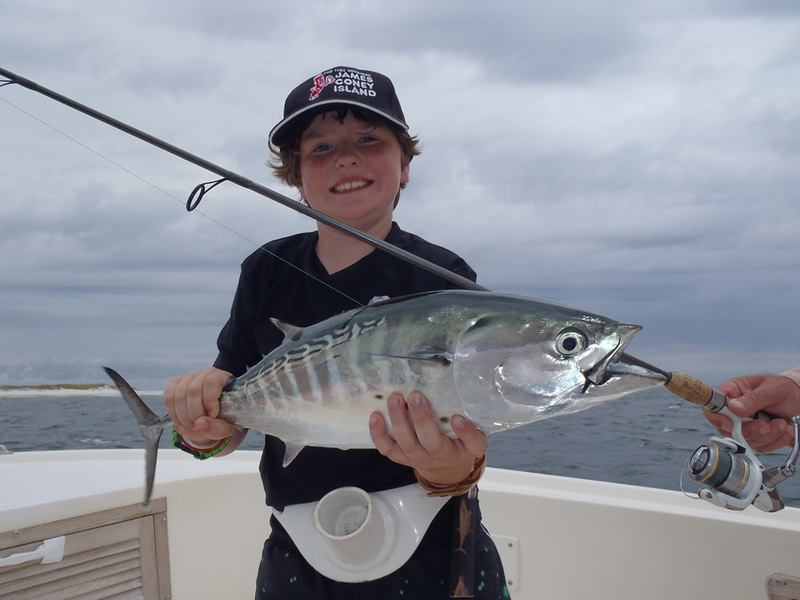 On July 20 Gray Overstreet with his first false albacore. Good job, Gray! 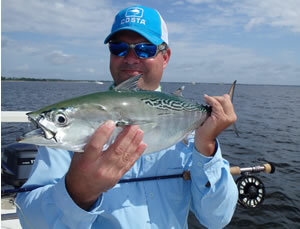 Brothers Andy and Eric Cobb were here on July 22, the day the big false albacore moved up into Pensacola Bay. 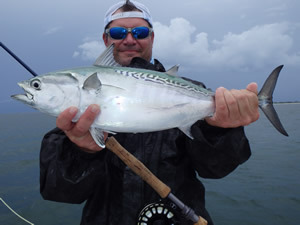 We spent the day catching albies and dodging thunderstorms The fish were eating bay anchovies which converts perfectly to a sz 6, clear, gummy minnow. 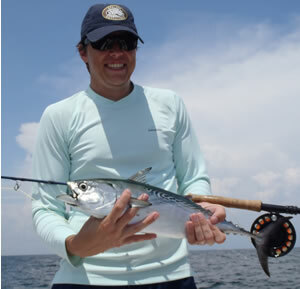 This is a nice shot of Andy with the first FA. 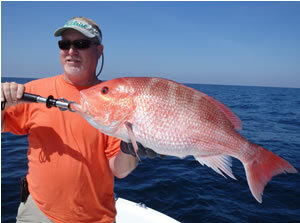 Eric had his line stretched in a serious way by this beauty. 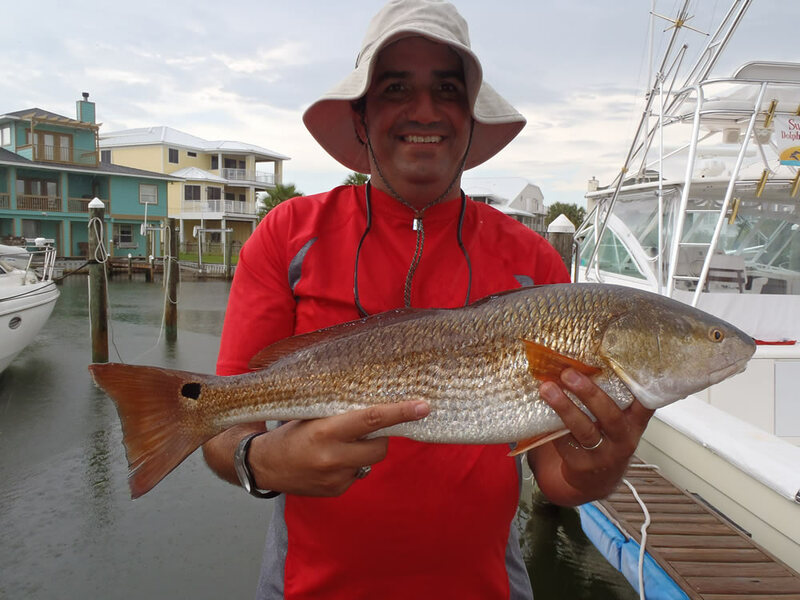 We ran into Bayou Grande to dodge a thunderstorm and ate lunch under a bridge in a downpour. 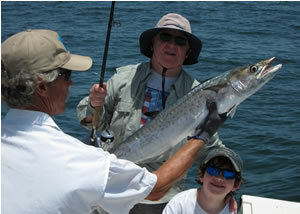 As soon as there was a hole in the weather we bolted back out to the "turning basin" and hooked up another albie. 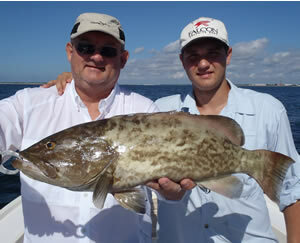 All these fish were in the 8 pound range...lovingly known as "Little Footballs". 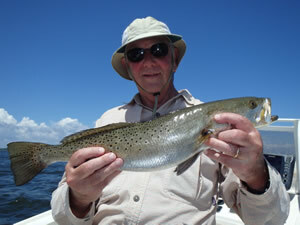 Here's a good shot of Spencer Voigt on July 23 with a nice trout. 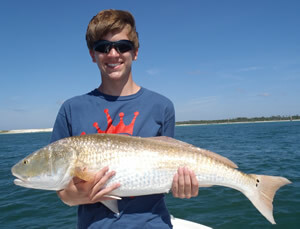 ...and a redfish. 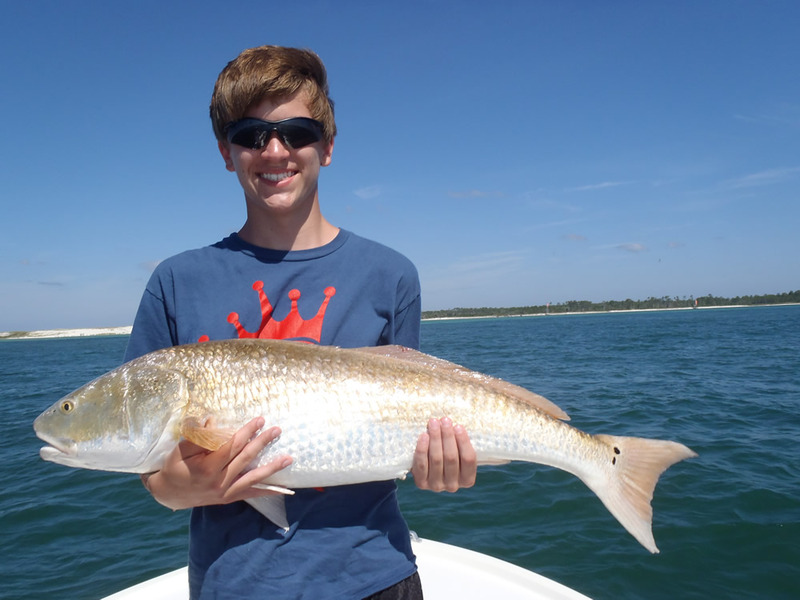 This young man is a fine fisherman. 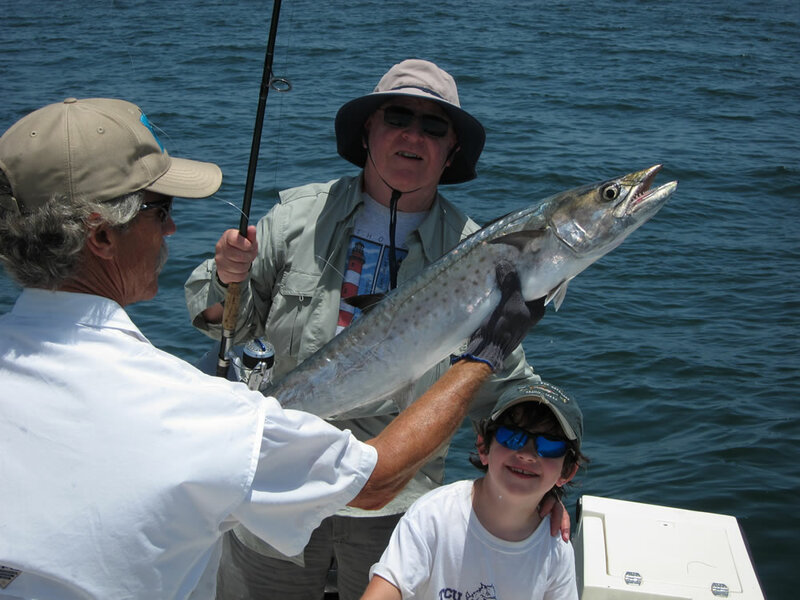 Spencer's grandfather Ken McDonald landed the fish of the day with this king mackerel. 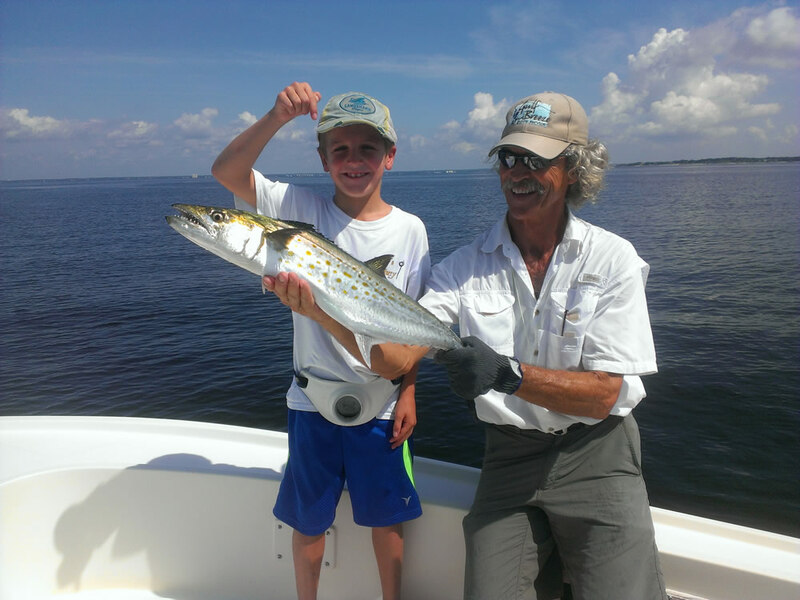 Michael Brooks had his hands full with this toothy Spanish mackerel on July 30. 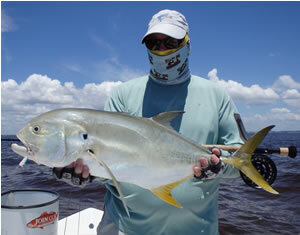 We blind-cast Acme "Sidewinder" spoons on ultra-light spinning tackle for these big fish which can weigh up to 8 pounds. Both redfish were beautiful deep-bronze colored and 26-27" long...perfect sized fish for the grill. 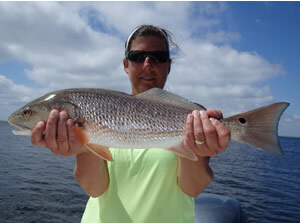 Louisanna redfish on the halfshell! 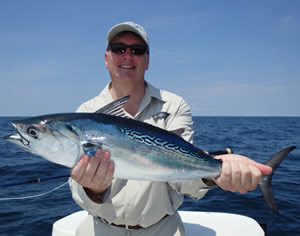 Here's a nice shot of Scott Kitchens on August 7, 2012, with his first false albacore on fly. This photo was from last year and missed the gallery. Sorry about that, Scott. 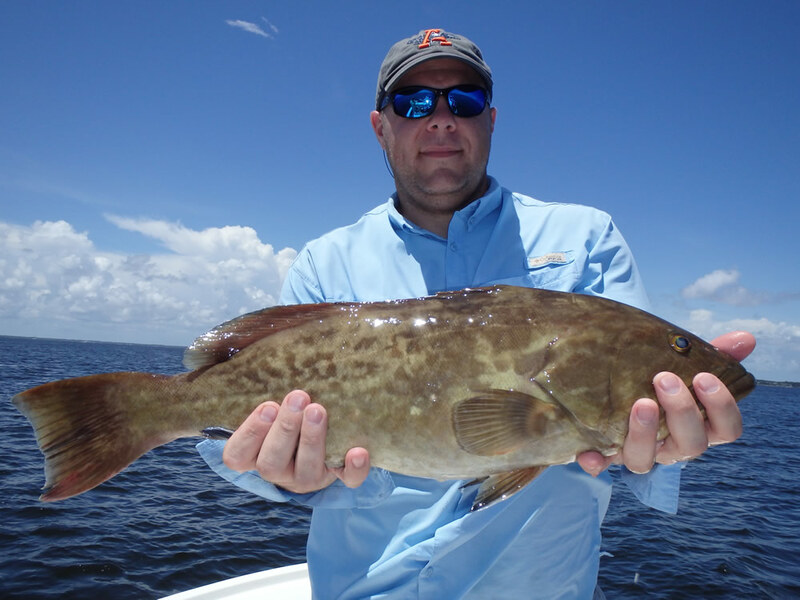 Spencer Ross, Chatham, Alabama, with a very fine Pensacola Bay gag grouper on August 9. 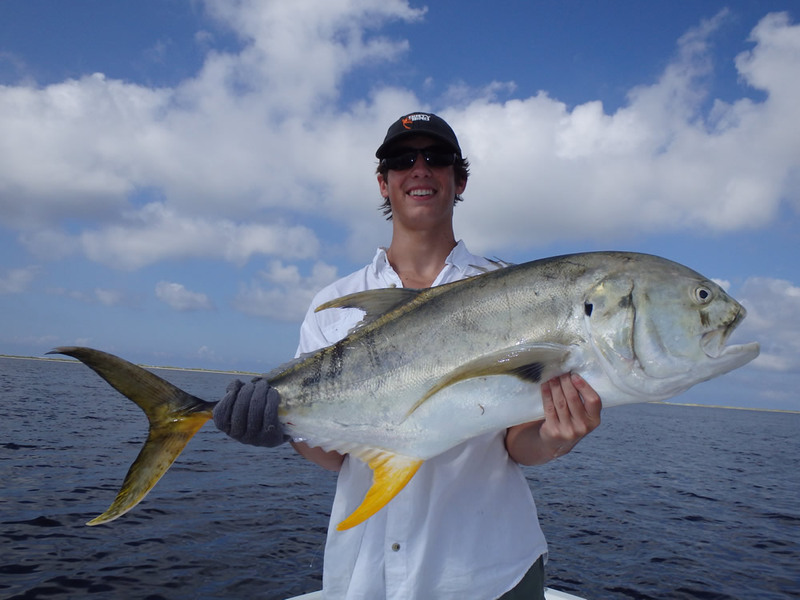 Colin Blackshear with the fish of the day on August 15. 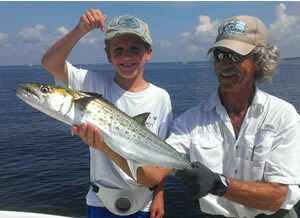 Kevin Fox and son Noah got into the action August 21 with some serious inshore fun. 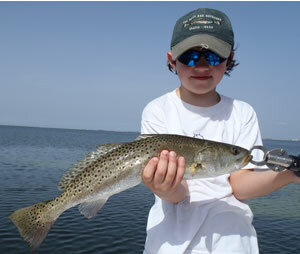 Here's Noah with an impressive speckled trout landed on live shrimp while mangrove snapper fishing. 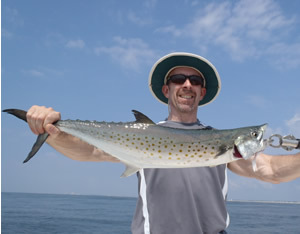 Kevin Fox with a "yank your arms off" Spanish mackerel on ultra-light spinning tackle. 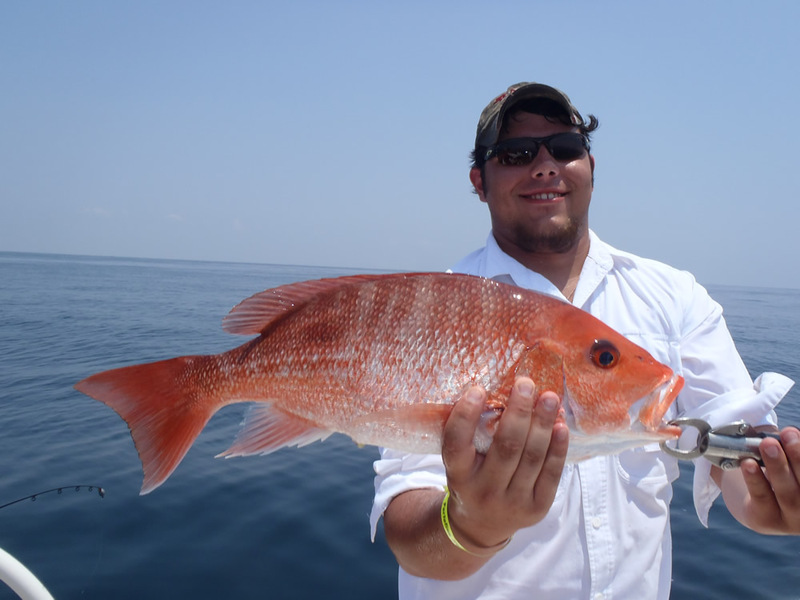 Red snapper season's closed, but that doesn't mean we can't catch and release them. 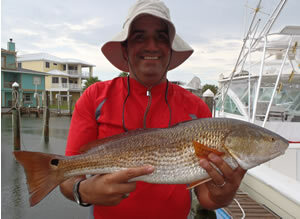 This is Steve Bartosik with a beauty on August 27. 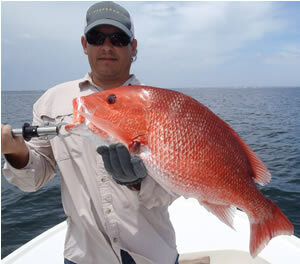 Roy Davis with another monster snapper the following day August 28. 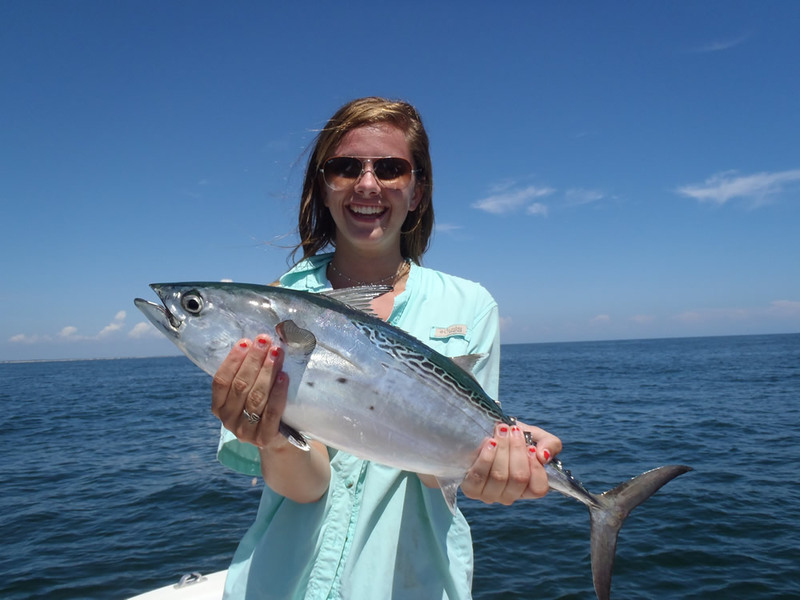 Merrill Bowman had her hands full with this super-charged false albacore on September 1. 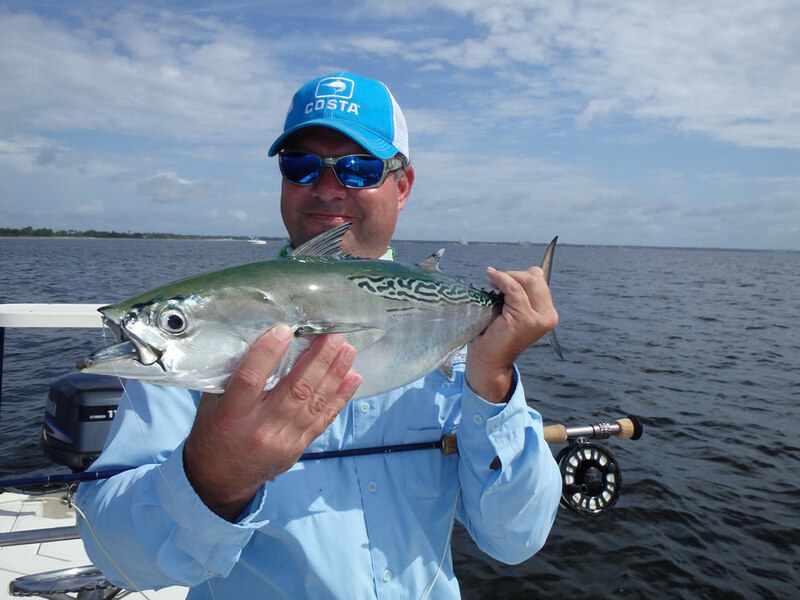 Our spin-anglers use ultra-light St Croix rods, Shimano Stradic 3000 FJ reels, 15# Powerpro braid, and Acme "Sidewinder "spoons for these "little tunas". 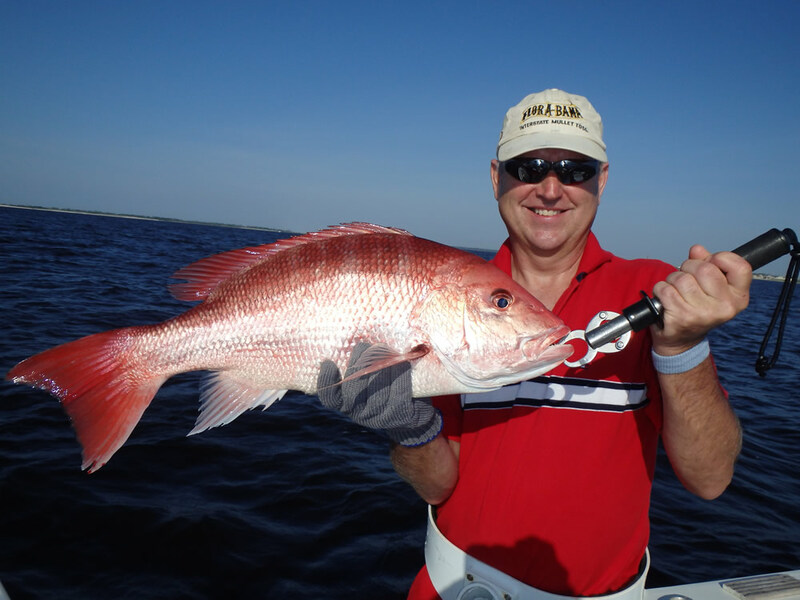 Since we release the fish we replace the treble hook with a 2/0 single hook and mash the barb down. 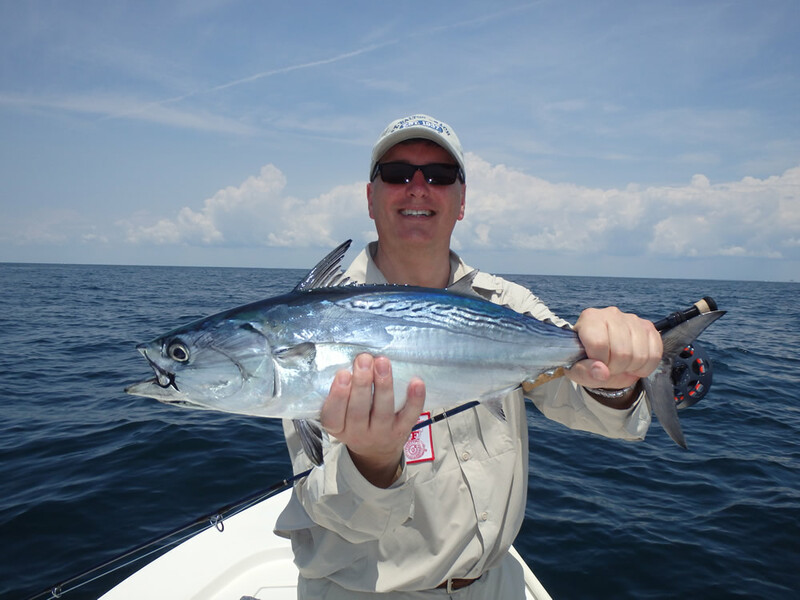 It always feels good to release these terrific gamefish to fight another day. 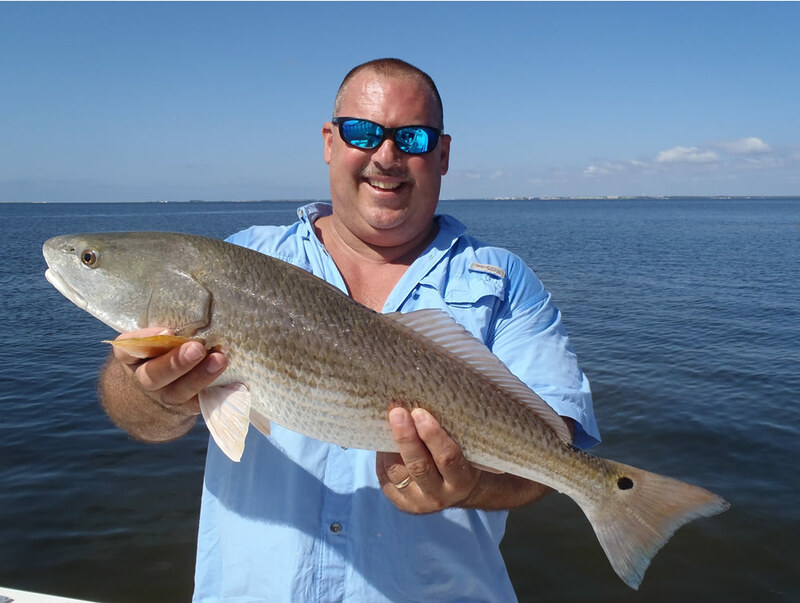 On September 3 Glenn Perry, Birmingham, Alabama, started the morning casting clouser minnows along the south side of the channel as we poled out of Bayou Grande. 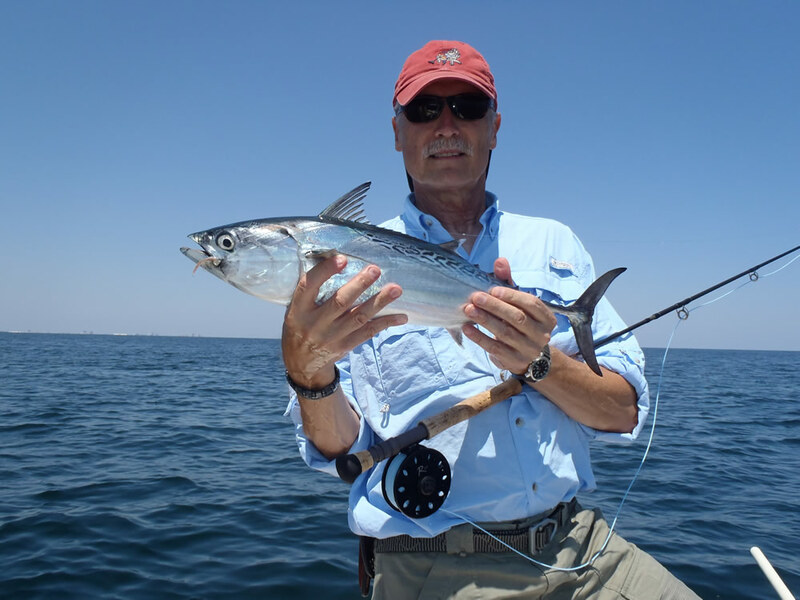 There were bluefish and ladyfish striking on top ahead of us, so Glenn tied on a small white popper and began blind-casting. 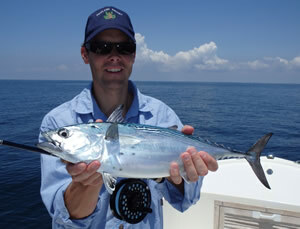 A bluefish exploded on it and started jumping and thrashing around on the surface trying frantically to escape. 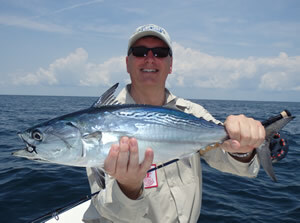 As Glenn brought it toward the boat a much larger fish swirled around the bluefish...possibly a shark. 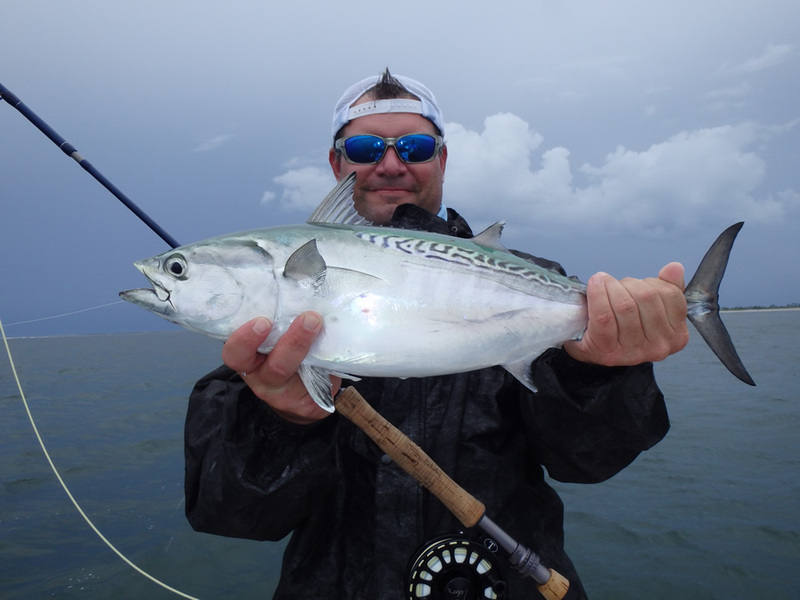 A split second later we realized it was a school of bull redfish, and Glenn dropped his rod tip allowing the bluefish to dive. 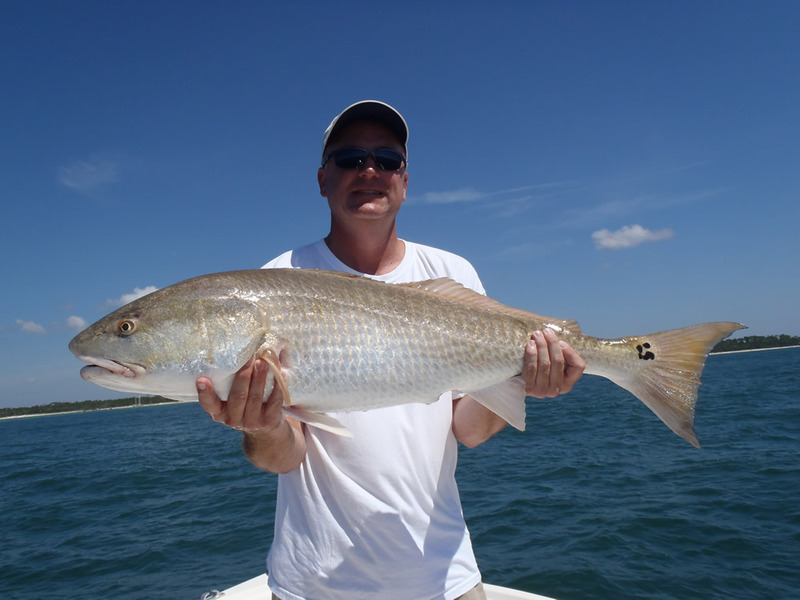 Suddenly he was hooked into something big, and we figured one of the redfish had eaten the bluefish. 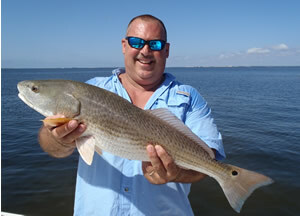 But when Glenn eventually brought the redfish to the boat it was hooked cleanly in the corner of the mouth as if the bluefish had never been there. How it all happened is a mystery for sure, and we will be talking about it for years. 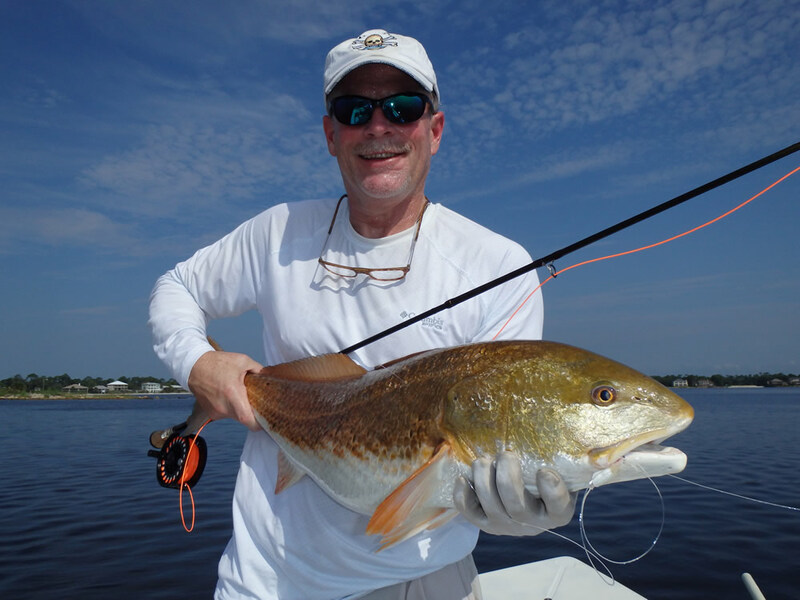 But one thing's for sure, landing a 20# redfish on an 8wt using a size 4 popper is a great way to start off a glassy-calm morning in early-September! 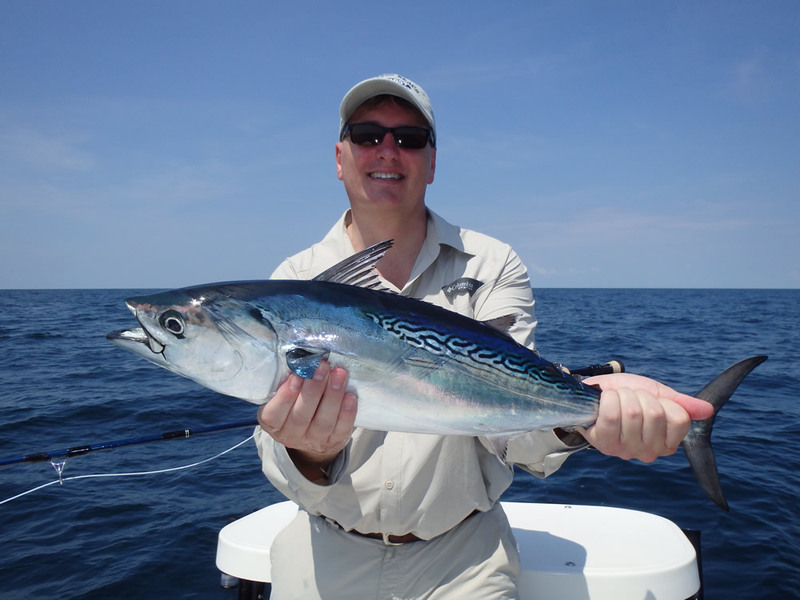 Bob Kelly and Cindy Bennett were back again this year, but the false albacore were nowhere to be found. 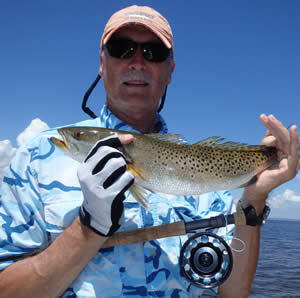 Bob landed this trout on a popper while blind-casting for Spanish mackerel. 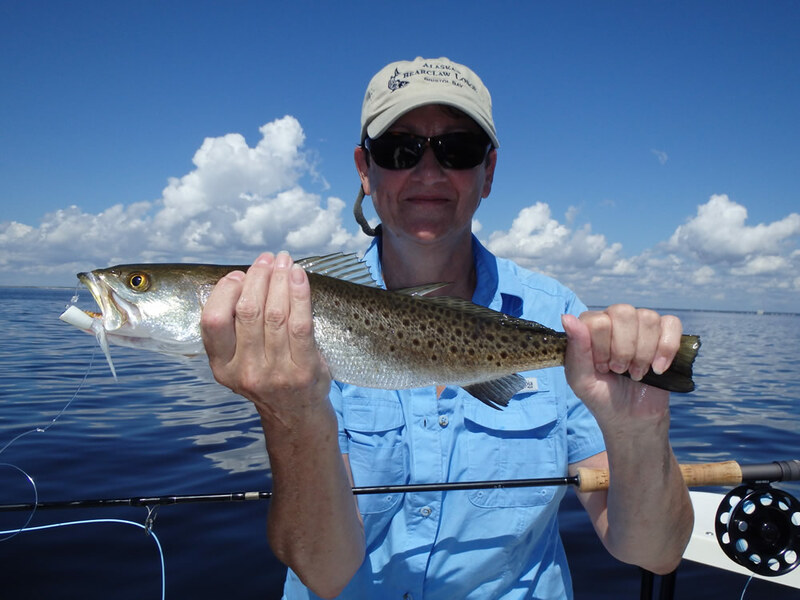 Cindy Bennett with the speckled trout of the day on September 5 also taken on a popper. 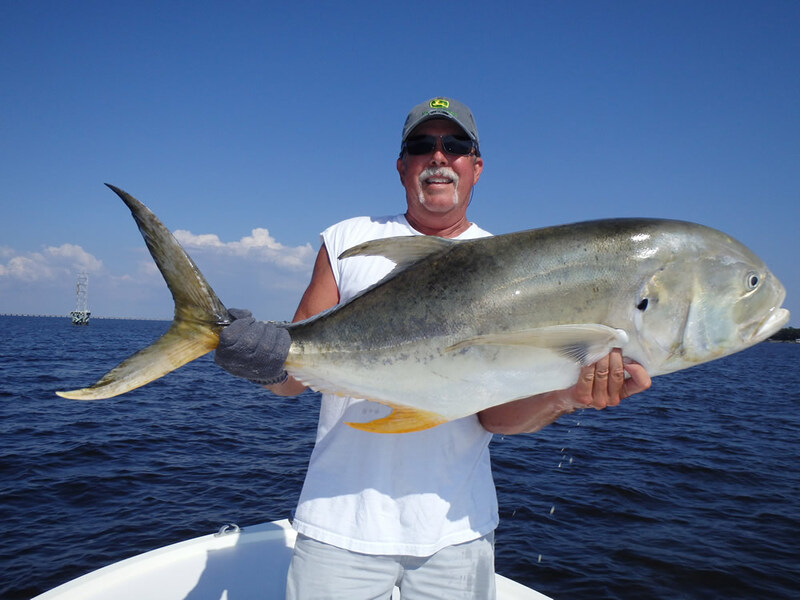 Tom Moodie and Wade Knight had one thing on their minds September 12...sight-fishing for big jack crevalle. 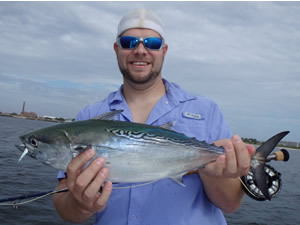 Tom and Wade were armed with heavy-action spinning tackle, 40# Powerpro braid, and big topwater plugs. We were pretty sure the big jacks would eventually be coming around our favorite point, so we anchored there and waited to ambush them. 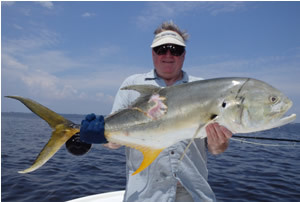 Before too long the mullet started showering a few hundreds yards away, and we could see the jacks exploding on them from below. Wade and Tom watched in adrenalin-pumped anticipation as the melee moved in our direction. 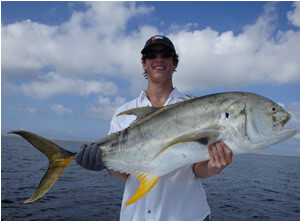 Suddenly the fish were on us, and Wade cast in front of them. 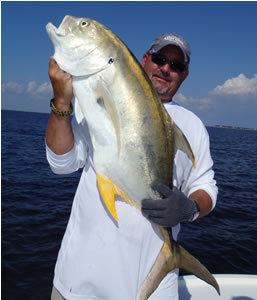 A giant jack climbed over the backs of the others, crushed his popper, and bolted to the north. 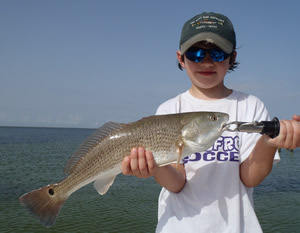 Tom's cast was also on the money, and he too hooked up immediately. 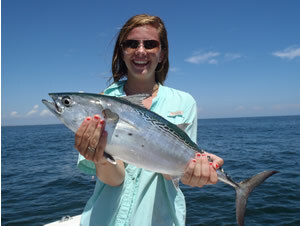 Both fish headed in the same direction which allowed us to unclip the anchor and idle along after them. 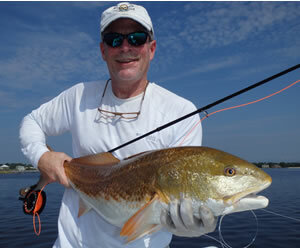 Tom, pictured here, boated his jack in about 25 minutes...a beautifully-colored fish in the 25# range. 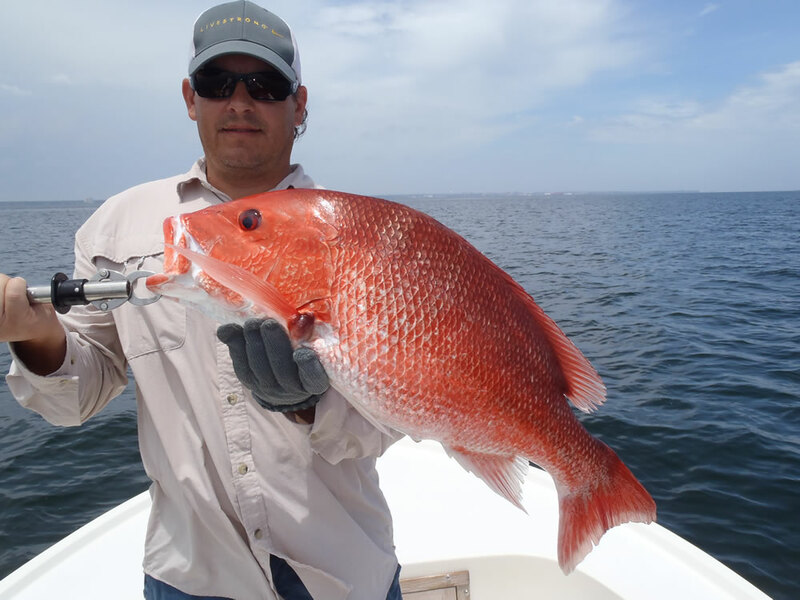 Some time later Wade landed this monster. 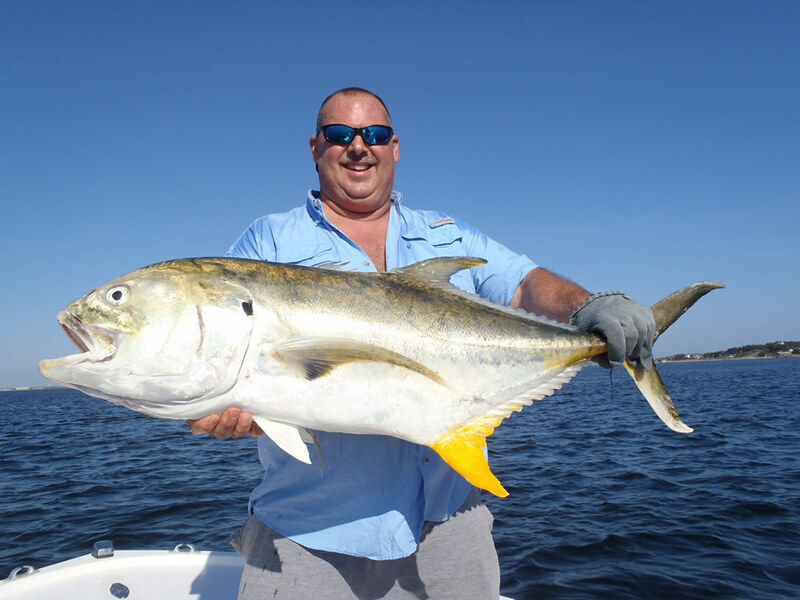 His fish bottomed out the 30# Bogagrip so completely that we estimated its weigh at 40#...the all-time boat record jack crevalle. As we laughingly say "It don't get no better!". 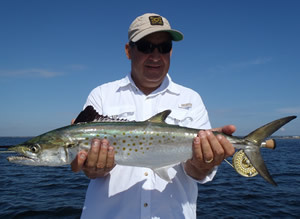 Here are a couple shots of Bernie Smelstoys from 2012 that didn't make last year's gallery. 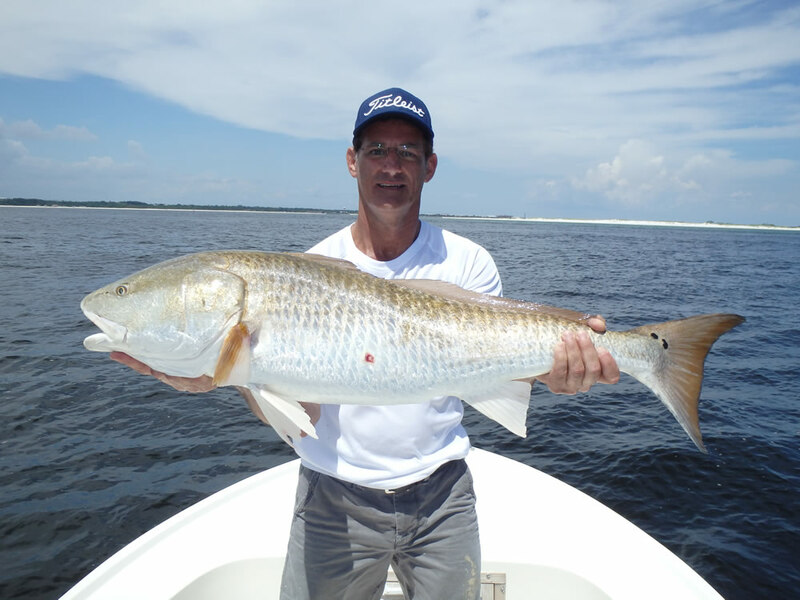 Bernie landed this slot-redfish on September 14 while free-lining live shrimp around a dock in Santa Rosa Sound. 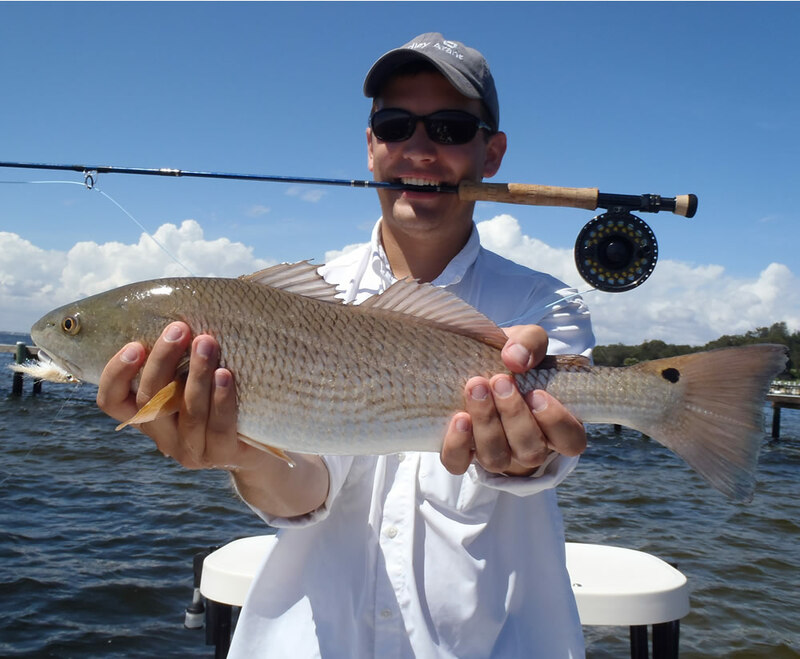 Jay Wright, Birmingham, Alabama, with his first redfish on fly landed September 15 on a gray/white EP baitfish pattern. Way to go, Jay! 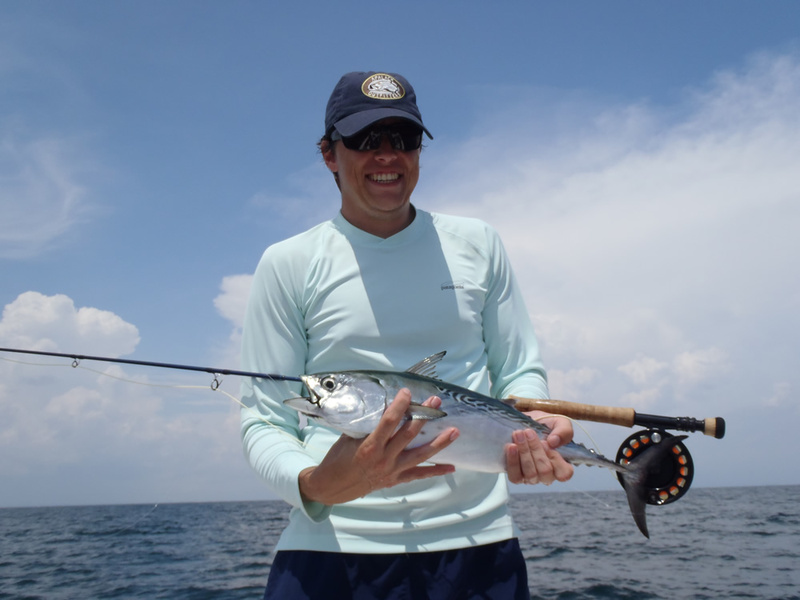 Jimmy Wright, also on September 15, with his first-ever saltwater fish on fly. 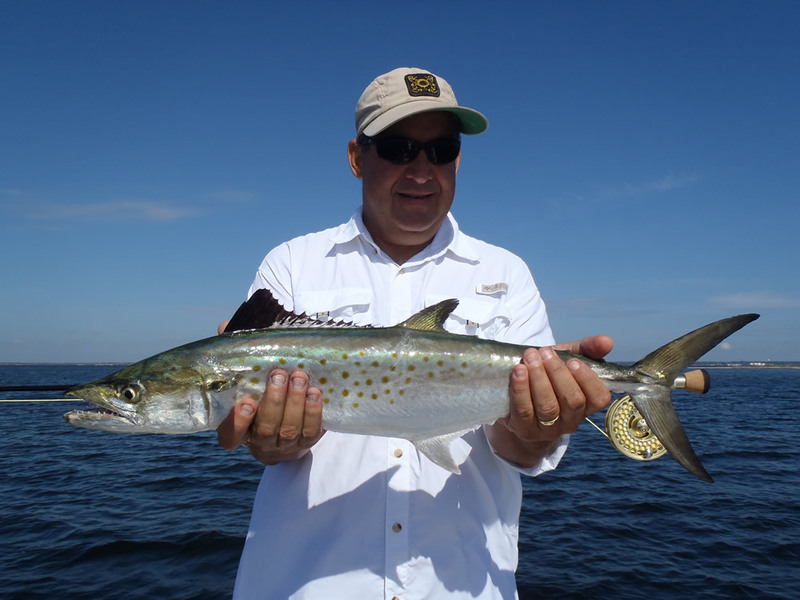 A 4-5# Spanish mackerel is one heck of a way to start! 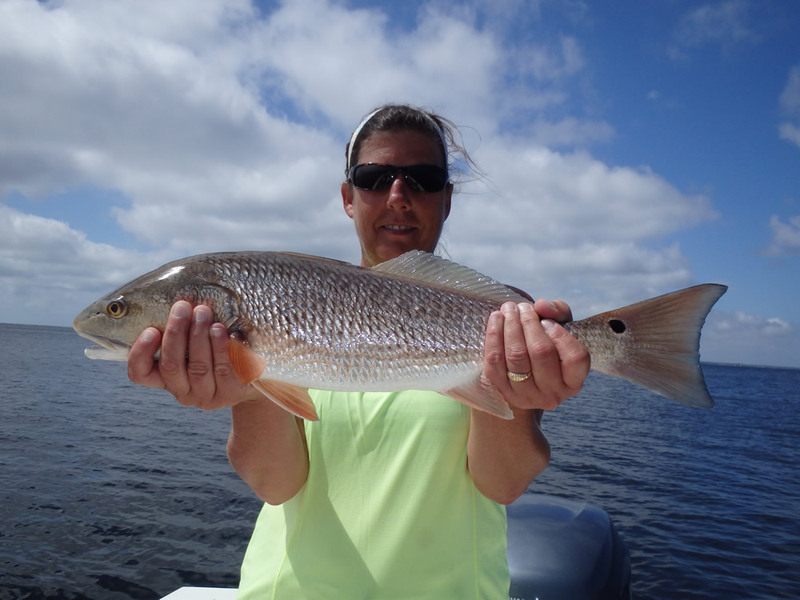 Casie Knight from Tigertown, TX, started off the day September 19 with this healthy slot-redfish landed and released unharmed. 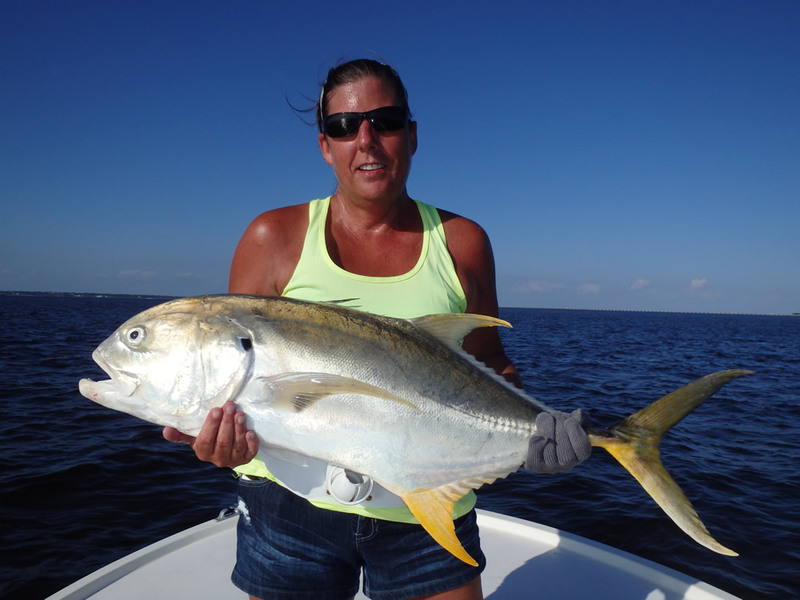 But things got a lot more interesting for Casie late in the day when we once again set up the the jack crevalle. 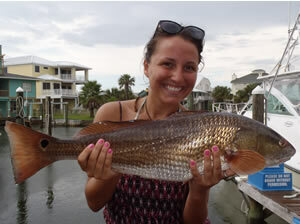 Casie's husband Wade cheered her on while she battled this fish for a half hour before bringing it to the boat for a photo and successful release. Whew!